You have a specific module for all possible functions that you want to integrate into your Niko Home control installation. 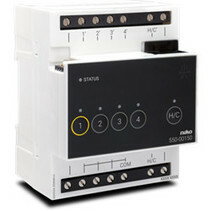 The connected controller is the central module of every Niko Home Control installation. It is preferably placed at the bottom left in the Niko Home Contol section of the control cabinet. He controls the basic functions of the Niko Home Control system. 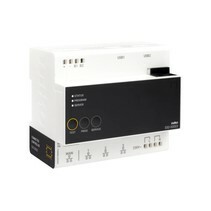 In combination with the connected controller, the power supply provides an additional 26 V voltage to the bus, modules and controls for installations larger than the power supply range of the built-in power supply in the connected controller. This module is always placed first on the left at the start of a new row of DIN rail modules on which no power is present. Via the contacts above and below you connect the power supply and the bus. 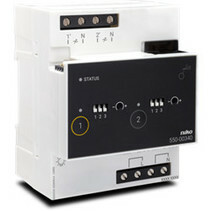 The triple or sixfold switch module is suitable for switching up to three or six different switching circuits, such as light points or wall sockets. With the module you can connect two neutral conductors for an orderly cabling in the cabinet. The universal dimming module is a DIN module with two channels for dimming light circuits. This module is suitable for incandescent lamps, 230V halogen lamps, 12V halogen lamps with a wound or electronic transformer, dimmable LED lamps (max 10) and dimmable CFLi energy saving lamps (max 10). 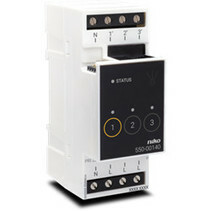 With the analog steering module 0-10 V you connect three high power dimmers to the Niko Home Control installation. 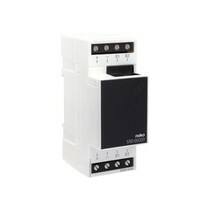 With the analogue control module 1-10 V you connect three dimmers and / or switchgear to the Niko Home Control installation. Thanks to this module, the resident can measure consumption or production on one switching circuit or phase. The module is suitable for measuring total consumption or total production in homes connected to a single-phase network. This module is also available for 3-phase connection. The ventilation module controls the central ventilation system via the Niko Home Control installation. The module is suitable for ventilation type C (mechanical drainage) and D (mechanical supply and drainage with heat recovery). The heating or cooling module controls the heating or cooling of up to four zones or rooms. Each zone or room must be equipped with a Niko Home Control thermostat. With the pulse counter you can monitor gas, water or electricity consumption or electricity production. 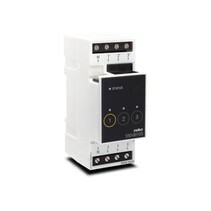 The module has three pulse inputs so you can connect it with up to three meters. 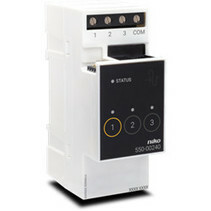 With the digital potential-free sensor module, you connect up to three sensors with an NO contact or NPN transistor output to the Niko Home Control installation. The connected sensors must be suitable for applications with a very low safety voltage (ZLVS). The motor module can control up to three applications powered by a motor, such as shutters, awnings and blinds. With the module you can connect two neutral conductors for an orderly cabling in the cabinet.